At least 413 people have been killed and over 2,500 injured in a massive 7.8-magnitude earthquake that hit the Ecuador coast. The quake was followed by a series of strong aftershocks. The disaster has ravaged coastal towns and left thousands of households without power. 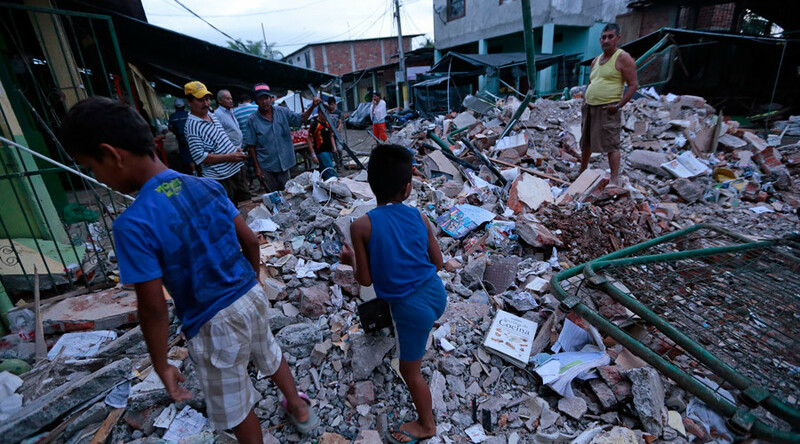 The death toll from the powerful earthquake has soared to 272, President Rafael Correa announced. At least 370 buildings were destroyed, and 151 more buildings including 26 schools were affected. Vice President Jorge Glas said that 10,000 military troops and 3,500 police officers had been dispatched to the affected areas and that $600 million in credit was allotted to the emergency. According to the latest government tally on Sunday evening, Saturday's quake killed 262 people and injured up to 2,500. More than 1,200 Red Cross volunteers were also helping to render first aid and search for an unspecified number of missing people, the country's vice president said. Jorge Glas also said that heavy machinery couldn't be used in search and rescue because it could put wounded people at greater risk. He pleaded with people to "be quiet so rescuers can listen for survivors."